Center Stage’s Amadeus is one of the more ambitious productions that the playhouse has put on in recent years. Dynamic and visually rich, the play has an engaging cast, effective choreography and beautiful period costumes that make for a sumptuous theatrical treat. The English playwright wrote Amadeus for the stage in 1979, and then adapted it to screen for the award-winning 1984 film. The play is a fictionalized story guided by the dying composer Antonio Salieri who, at the start of the play, claims to have poisoned Wolfgang Amadeus Mozart. The play then flashes back to Mozart’s unruly arrival in Vienna in 1781, and follows Salieri’s jealous sabotage of the young composer’s career. It is a play about envy and genius, and the creation of art and the creation of self. The costumes for the play are enjoyably extravagant. For the most part they feel authentic – at least to the untrained 21st century eye. 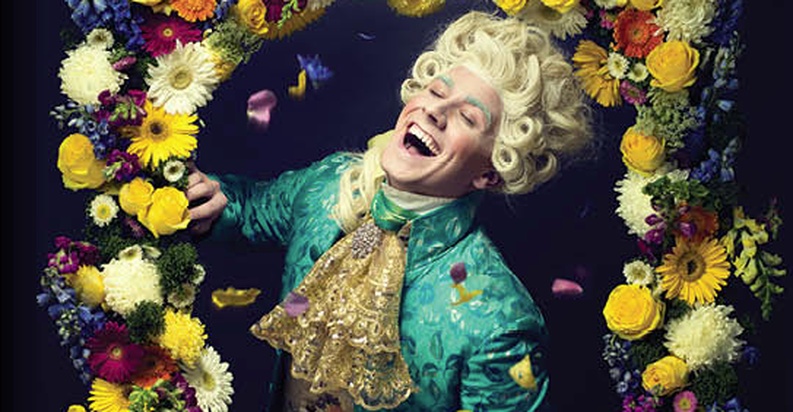 Of course, a big piece of Mozart’s quirky grandiosity comes from his colorfully clashing costumes. He almost always seems to be wearing five colors at a time. This contrast is one very effective way of building Salieri’s comparative dignity in the eyes of the audience. Similarly, the choreography of this production is vital not only in audience engagement, but as part of the storytelling process. Because Solieri is constantly interacting with the audience in longer monologues, the dynamic movement of his character keeps the journey of the story moving forward. Meanwhile, whenever Mozart steps on stage, his explosive and excitable presence contrasts strongly with the reserved stoicism of the aristocratic characters. Though there are moments that seem almost too cinematic – such as the frequent freezing of characters mid pose – for the most part the choreography works to consistently enhance the story. But as is always the case in theater, the heart of the play lies in the actors, most especially in the two main characters. Mozart, played by Stanton Nash, is written as an immature and initially unlikable character. If at times Nash’s performance seemed over the top – especially in the earliest scenes of the play – it only worked to further our attachment to our anti-hero Solieri. Nash’s flamboyance in the first half of the play deflated considerably in the second, and it is his effective dissolution into madness that earns our pity as the play progresses. The anchor of the entire performance is Bruce Randolph Nelson as Solieri. From the very beginning he builds an intimacy and rapport with the audience. As the story builds momentum, Nelson’s wryness and sincerity means we cannot help but side with Solieri, even as he pulls the strings that will lead to Mozart’s unraveling. Nelson’s performance is especially moving in moments where he listens to Mozart’s compositions. The layering of emotions – of being simultaneously moved by the music and incredibly jealous of its origins – is astounding. Though the run of Amadeus at Center Stage is now over, many are undoubtedly still feeling the play’s impact. If you are interested in seeing a performance at the theater, the contemporary rock opera Next to Normal will be running through mid-November.